Most of the United States’ 10.7 million unauthorized immigrants live in just 20 major metropolitan areas, with the largest populations in New York, Los Angeles, Houston and Dallas-Fort Worth, according to new Pew Research Center estimates based on government data. The nation’s unauthorized immigrant population is highly concentrated, more so than the U.S. population overall. In 2016, the 20 metro areas with the most unauthorized immigrants were home to 6.5 million of them, or 61% of the estimated nationwide total. By contrast, only 37% of the total U.S. population lived in those metro areas. View detailed tables on the unauthorized immigrant population in 182 U.S. metropolitan areas. The number of unauthorized immigrants in these 20 metros has declined sharply since 2007, when 7.7 million of them lived in these areas. These metro areas account for much of a national decline of the U.S. unauthorized immigrant population over the past decade. 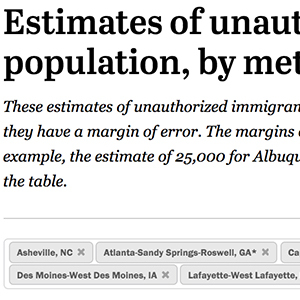 Explore which U.S. metro areas unauthorized immigrants live in with an interactive table or download the data. By far the biggest unauthorized immigrant populations in 2016 were in the New York (1.1 million) and Los Angeles metro areas (925,000). Both metros had unauthorized immigrant populations that exceeded the statewide total in every state except California and Texas. No other metro area approached a million. Meanwhile, the smallest unauthorized immigrant populations among the top 20 areas were in Austin and Charlotte (100,000 each). Five of the 20 metros with the largest unauthorized immigrant populations are in California: Los Angeles, Riverside-San Bernardino, San Francisco, San Diego and San Jose. Three – Houston, Dallas-Fort Worth, and Austin – are in Texas. The top 20 metropolitan areas for unauthorized immigrants have been remarkably consistent over the past decade, according to the Center’s analysis. The top 18 areas have ranked among the top 18 in each year since 2005. 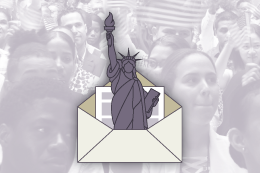 The Center’s analysis relies on augmented data from the Census Bureau’s American Community Survey, using the same residual method as its previous reports on unauthorized immigrants. Unauthorized immigrants include people who either crossed the border illegally or overstayed their visas. These estimates have margins of error, so many apparent differences in unauthorized immigrant populations between metros are not statistically significant. In 2016, only seven of the 182 U.S. metro areas analyzed had significantly larger unauthorized immigrant populations than the areas ranked immediately below them. All are among the top 20 metro areas (see table). More metro areas lost unauthorized immigrants than gained them between 2007 and 2016. And while many metros had small apparent declines within the margin of error, 28 of the areas analyzed had statistically significant smaller unauthorized immigrant populations in 2016 than in 2007. Seven of the top 20 metro areas saw significant declines, including New York City and Los Angeles. Only 10 of all the metro areas analyzed had larger unauthorized immigrant populations in 2016 than in 2007, including three of the top 20 — Washington, Boston and Charlotte. Nationally, unauthorized immigrants made up 3.3% of the U.S. population in 2016. Among the top 20 metro areas, only Philadelphia (2.6%) had a lower share of unauthorized immigrants than the national population, while Las Vegas (8.2%) had the highest share. Unauthorized immigrants account for slightly less than one-in-four foreign-born U.S. residents. Among the top 20 metro areas, they make up somewhat higher shares of immigrants in Charlotte, Las Vegas, Dallas-Fort Worth, Atlanta, Denver, Austin, Houston, Phoenix and Washington. They make up a somewhat lower share of all immigrants in the Seattle, San Diego, Los Angeles, New York, San Jose, Miami and San Francisco metro areas. Note: This is an update of a post originally published Feb. 9, 2017. For an interactive graphic showing unauthorized immigrant population estimates and trends for the U.S., states and countries of birth, click here.